Real stories we have from from around the globe. As you might imagine, becoming paralysed at age 11 wasn't quite part of my life plan. However, this was what happened to me in August 1993 when I sustained a spinal cord injury. And yet, I think it was the fact I was only 11 year old, which became my saving grace. Children, properly supported, can be even more resilient than adults. Now, as a solicitor, I represent clients who have sustained similar catastrophic injuries. Everyday, I see the worries they have about financing their new life and injury; whether they can return to work, or even their own home; and of course the stresses their new injury puts on their personal relationships. I try my best to help them through this with the benefit of my own experiences both professional and personal. A silver lining out of wars is perhaps the medical innovations from the battleground. Due to serious casualties and limited resources, doctors, nurses, and paramedics had to be creative on the battlefield. Here are some of the medical innovations used in modern medicine that were developed during wars. COLORADO SPRINGS, Colo. — Edwin Moses turned the corner, saw the blue police lights in the distance and, immediately, started spinning. His senses overwhelmed by the strength of the strobing lights, Moses fell to the ground and crawled to the sidewalk, then used every ounce of energy to stand up and stagger back to his car. The Defense and Veterans Brain Injury Center has been tracking traumatic brain injury (TBI) in the U.S. military since 2000. In the past 17 years, 370,688 service members have been diagnosed with a mild to severe cases of TBI, or disruption of normal brain function, caused by motor vehicle accidents, bomb blasts, falls and other head trauma. Opened my eyes to see a clear blue sky and two men leaning over me to put a brace around my neck. I don’t know if I was already on the stretcher or if I was still on the pavement, but there are plenty of things I don’t remember. As I would later find out, I had a brain injury. A TETRAPLEGIC Grasmere man has raised thousands of pounds for a spinal injury charity by ascending Snowdon with the help of friends and a specially adapted chair. Will Clark took on the challenge for Back-Up Trust, who helped him after he was paralysed in a cycling accident. His effort, which he called 'Get Will Up a Hill', has raised over £7,500 so far. The original target was £5,000. A 2014 hunting accident left 26-year-old Cameron Stovall completely blind, but revolutionary surgery by Birmingham doctors has restored his vision in his left eye. Stovall’s success came full circle at the Birmingham Barons game onThursday. He threw the first pitch of the game, which was caught by one of the doctors who helped save his vision. A TETRAPLEGIC Lake District man is to mark five years since the cycling accident that caused his spinal injury by ascending Snowdon with the help of a team of family and friends. 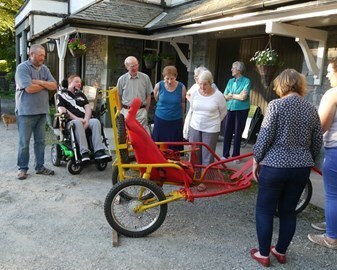 Will Clark, of Grasmere, will be using a specially-adapted chair to be pushed up the mountain, and hopes to raise £5,000 for spinal injury charity Back-Up Trust in the process. The chair is now ready, meaning the intrepid expedition can take place this weekend. 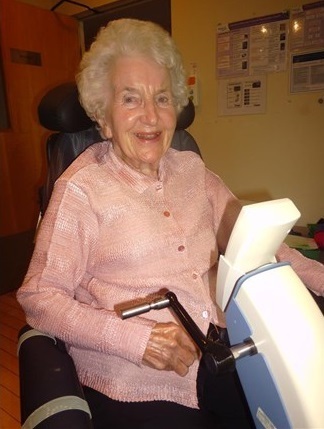 An ‘amazing’ 96-year-old woman will be starting a charity walk for the hospital that helped her learn to walk again after her spinal cord injury. Mary Tye, from Claygate, will begin the Buttercup Walk, in aid of the Royal National Orthopaedic Hospital (RNOH) this Sunday, June 25, at noon. She broke her neck in 2008 and wants to take this opportunity to thank the staff for the received surgery and rehabilitation she received. Mary said: “You should never let life get you down. Just keep your head held high and focus on what’s important: living life to the full. One after another, everything cracked. First went the brick wall he never saw and the front end of the Chrysler minivan he never meant to send crashing into it. Then the impact shattered his ankles, the screen of his cellphone and his right arm, and finally, agonizingly, the fragile vertebrae that surrounded Nick Stockwell’s spinal cord. Paramedics came to the Holiday Inn parking lot and pried him out of the front seat. He tried to stand, but only half of his body responded: In his chest and arms he felt nothing but pain, and in his legs he felt nothing at all. He collapsed to the pavement.